Plantar Fasciitis: The Pain That Won’t Go Away? Can Stretching Really Be Bad? Did You Know? On any given day, more than 25,000 people will sprain their ankle. The term ‘sprain’ specifically refers to the ligaments of a joint being stretched. They can range in severity and are a very common occurrence. The ligaments on the outside of our ankles are particularly vulnerable, but sprains can also involve the ligaments that hold the 2 bones of the lower leg together, the tibia and fibula. That is known as a ‘High Ankle Sprain’. 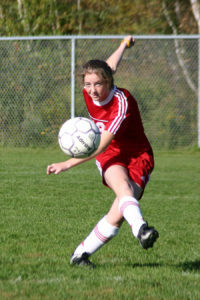 The inside ligaments can also be injured but that is much less common. Without proper treatment, this can lead to chronic sprains. In addition, you can injure muscles along with the ligaments. Ankle sprains can result in a significant amount of swelling. The swelling can be the source of a large amount of the disability of the injury and the delay in the return to normal use. The receptors that provide position sense and tell the body where it is in space, are located in the ligaments especially. So injury here, and swelling, reduce the function of these receptors. Restoring your ability ‘to balance’ can be essential, not only to initial recovery, but also in preventing a recurrence. 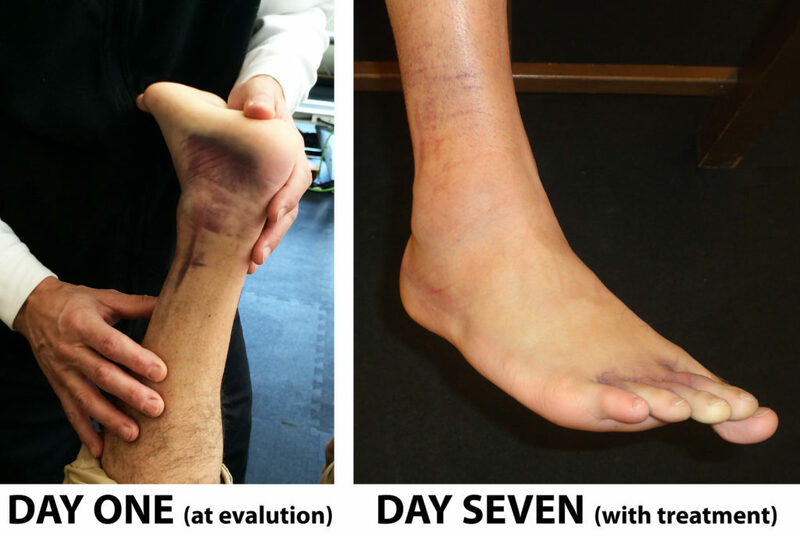 Immediate and appropriate care can result in rapid improvement and full resolution, even with a very swollen ankle sprain (see the photos). Recent research indicates that recovery is improved with manual physical therapy and an exercise program specifically designed for the individual’s injury. While the length of treatment may vary with the severity of the injury, left untreated, recurrent sprains can lead to a more permanent disability. The use of temporary taping, ankle supports and braces, and even orthotics, may each be helpful in the management of some cases, not all. And safely weaning off of supports is important in restoring normal function in all but the more severely injured joints. A treatment approach that is tailored to the specific needs of the individual injury is the key to an optimal result, and the most rapid safe return to full function. Client: 18 year old male athlete. Mechanism of Injury: Rolled playing basketball. Presentation: Lots of swelling, bruising, pain, and limited range of motion. Treatment Plan: Manual therapy and massage to reduce swelling and improve movement. Electric stimulation and Kinesio tape to help with swelling reduction. Therapeutic exercise to regain range of motion, strength, and reduce swelling. Restoration of movement patterns for balance and coordination. Functional testing for safe return to sport. Outcome: Return to competition within two weeks and just five treatments! Call us for an evaluation (603) 643-7788. We can often get you in within 24 hours.